Ancient Stones - Lothian - 008 Stone, Crow Moss, Cranshaws. 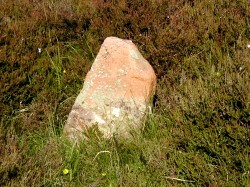 A small, earth-fast stone less than 300mm high, not far from two other groups of stones. No details at present. This stone is marked as an antiquity on OS Explorer 345 but the stone found did not seem very significant. Taking the B6355 east from Gifford stop near the electricity pylons at the entrance to Mayshiel Farm. Follow the fence line down to Kingside Burn then head east towards the pylon, keeping to the fence. The stones can be found just north of the pylon. Grass verge beside electricity pylons. Not really worth the effort of a visit for its own sake but you might as well take a look as you will pass this small stone should you be heading for the Stone Circle on Nine Stone Rig nearby. Or perhaps, I'm missing something here?